Thanks to you, the Alacrima doc set has been completed. We’ve added a new doc set, but the CDG and O-glycosylation doc sets still need a lot of help. The CDG doc set is already close to 80% complete, but it is a huge doc set. Help complete it: http://mark2cure.org. Leaderboard improvements– Top the monthly, weekly, or daily charts! Contribute today and make your mark! Load times– Max has been optimizing some of the code so the dashboard and docs should load much more quickly now. In case you missed Andrew’s live stream talk about Mark2Cure at the Stanford Big Data to Biomedicine conference, Stanford has finally released the video. The use of math and numbers…oh be still, my nerdy heart. Congratulations to our photo contest winner! She wins a nifty Mark2Cure t-shirt. We still have two left, so we’re extending the deadline to the end of July. Enter the contest for a chance to win one. 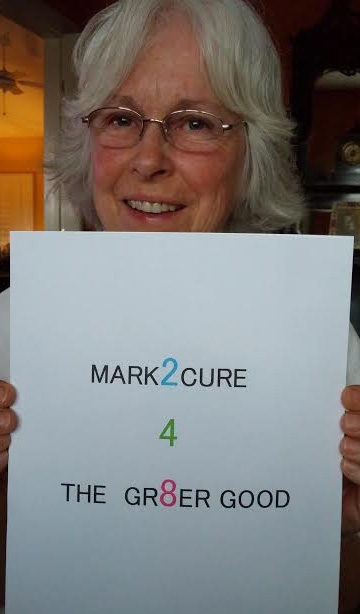 Take a selfie or a photo with a sign explaining Why you mark2cure. Email the photo to gtsueng(at)scripps(period)edu and include your Mark2Cure user name, so we can see your contributions. According to our last poll half of our voters thought the new green was distinct enough from the blue, and the other half disagreed. You’re still welcome to make your opinion count here. This week’s poll is focused on the newly revamped leaderboard.